Over the years we’ve worked to bring bankruptcy attorneys the content and tools they need to practice efficiently, from developing the cloud-based filing system TopForm.law, to providing a research platform for practitioners that need to find answers as quickly as possible. But for the first time we are pleased to provide specialized bankruptcy-focused content from a true industry leader. 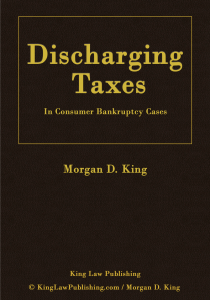 Morgan King’s Discharging Taxes in Consumer Bankruptcy Cases is now available as an annual subscription within Fastcase. Discharging Taxes explains with clarity and precision how and when taxes can be erased in Chapter 7 or Chapter 13 cases. The book has been used by lawyers, trustees, judges, and other tax professionals for over 30 years. In addition to authoring a wide range of practice desk books on consumer bankruptcy law and delinquent tax remedies, Morgan King was awarded the Distinguished Service Award from the National Association of Consumer Bankruptcy Attorneys (NACBA) and frequently lectures on the topic of discharging taxes in bankruptcy cases, a subject he is widely considered to be a nationwide expert on. We are proud to welcome Morgan King’s expertly-authored content to Fastcase’s growing library of treatises, books, and digests. To learn more and subscribe send a message to sales@fastcase.com or call 202.999.4777.